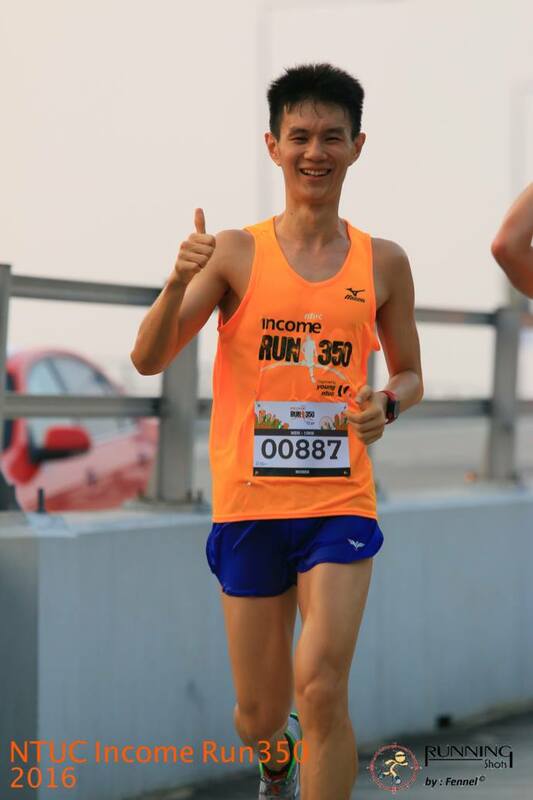 Race Review: Run 350 2016 [10km] (by Moses) | JustRunLah! Having signed up for the previous two editions of this race (of which I have pleasant recollections), I naturally decided to continue this streak. More importantly however, this race had a respectable cause that I supported – aiming to raise awareness of the need to lower the amount of carbon dioxide in the atmosphere to 350ppm! As with my other race reviews, do look out for the font in italics. 4 categories were available for participants to choose from, involving 2 competitive (HM, 10km) and 2 non-competitive (Kids’ Dash, Fun On Wheels) categories, thus catering to a wide target audience. 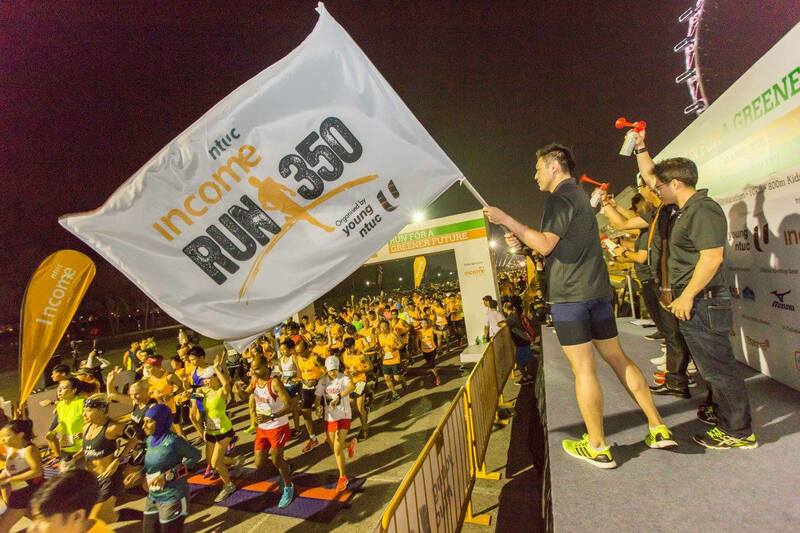 Registration fees were very affordable for those with discounts (Loyal Runners, NTUC/nEbO members/NTUC Income Policyholders) – a HM could cost as little as $33 (very affordable in comparison to most local races). 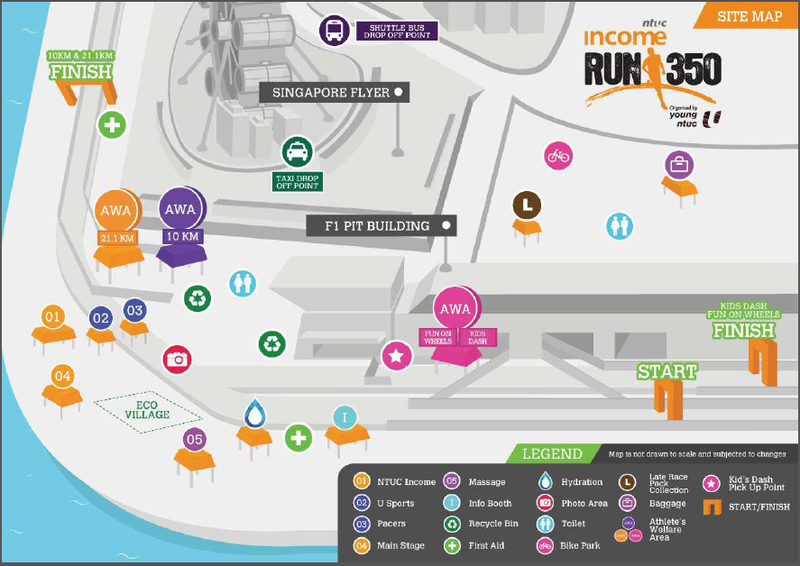 Race Entry Pack Collection was held from 25-27 March 2016 from 11am-8pm at the Marina Square Central Atrium. There were a variety of merchandise booths, including a giant sculpture (on which every participant’s name was printed) amongst other features. Located at the F1 Pit Building, it was a reminder of the previous week’s 2XU Compression Run 2016. Baggage deposit and portable toilets (5min~ queue at approx 6.20am) were available. The Race Precinct. Credit to Run350’s Race Guide. Having managed to enter the start pen only at about 6.25am, my friend and I managed to get into the second wave. The first wave was flagged off promptly at 6.30am, while the second wave was flagged off 5mins after. 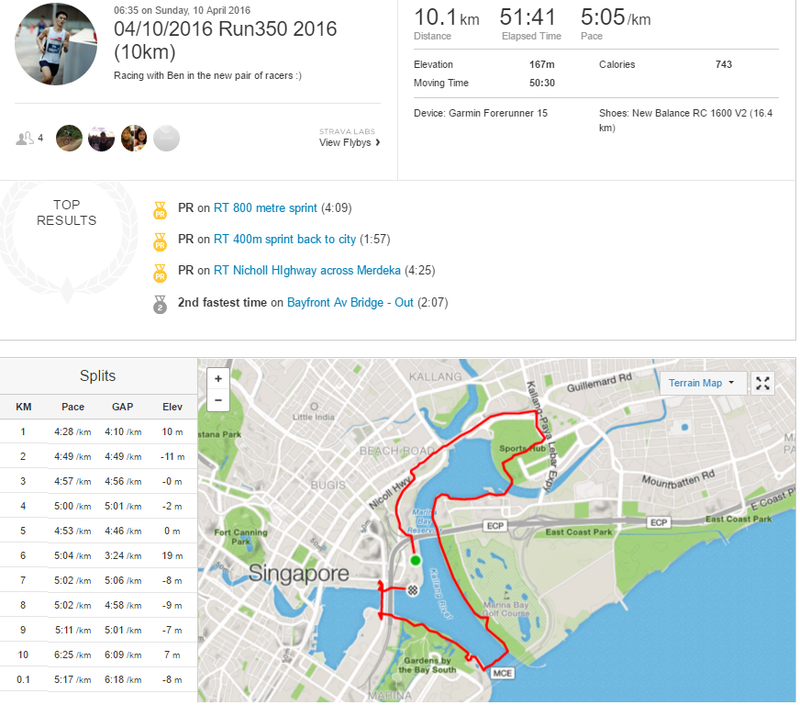 The race route was largely similar to that which 10km runners of the previous week’s 2XU Compression Run may have experienced. Here you go! 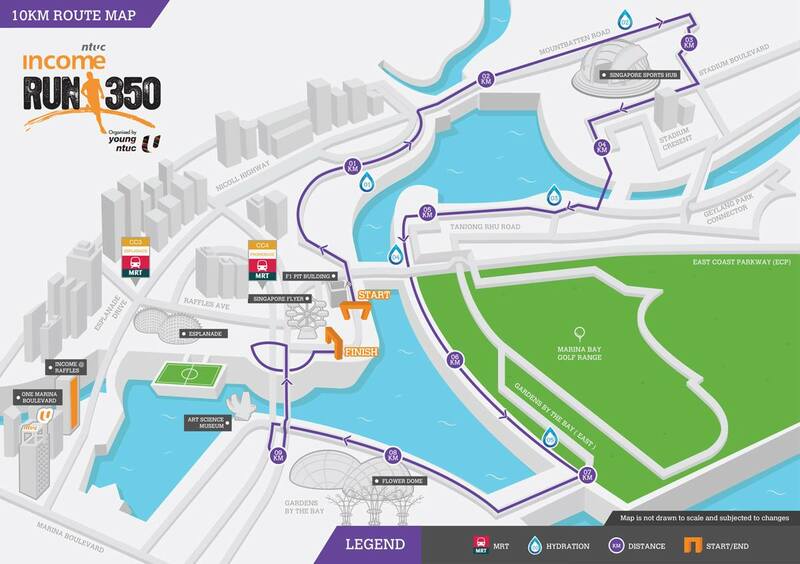 The 10km Route. Credit to Run350’s Facebook Page. The route did pose a few notable challenges. Firstly, 10km and HM runners merged and diverged during a few occasions – this meant possible room for misdirection if signs were not conspicuous or volunteers were not proactive (or if runners were inattentive). Secondly, there a brief technical portion of the route near the Marina Bay Golf Range involving a series of sharp turns. If not for that, the route was largely uneventful. Along Bayfront Bridge. Credit to Running Shots. 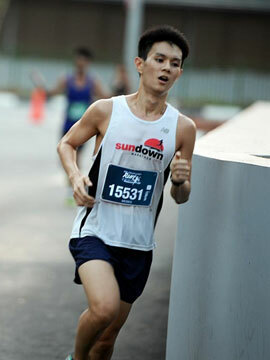 Hydration stations were available at five points along the 10km course, serving both isotonic drink and plain water. In the spirit of reducing our carbon footprint, refill points were also available for participants who brought their own bottles or hydration devices. Distance markers were generally accurate for the 10km route, with my GPS data coinciding quite accurately (at least, by the time I reached the Finish). A Finisher’s Medal was handed out to participants of the 10km category, in addition to a banana and a can of 100 Plus. There were multiple post-race activities available for participants to engage in, such as the Eco Village, a massage, etc. Last but not least, race results were available 2 days after the race. Cover photo credit: Run350’s Facebook Page.